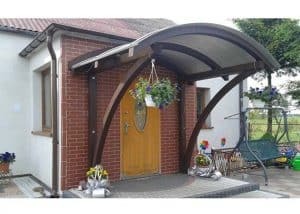 Door Roofing - Jagram-Pro S.A.
Semi-circular Roofing over the front door are an ideal solution, protecting against weather conditions. Our door roofing is made of high quality raw materials, laminated timber and is pressure impregnated against mould and fungi. Prior to purchasing a structure, please familiarise yourself with laws concerning construction notifications/permits. Our roofing is made of high quality raw materials, laminated timber and is pressure impregnated against mould and fungi.